Virtually every summer, devoted fans of Gene Kelly will come across “Gene Kelly’s Flavor Tips for the Barbecue," a 1955 Durkee Foods ad featuring the Hollywood song-and-dance man grilling what appears to be an entire cow. Also included are recipes for corn on the cob, deviled eggs, and potato salad supreme. Pairing Gene Kelly—or Hollywood stars in general—with food or recipes is nothing new. 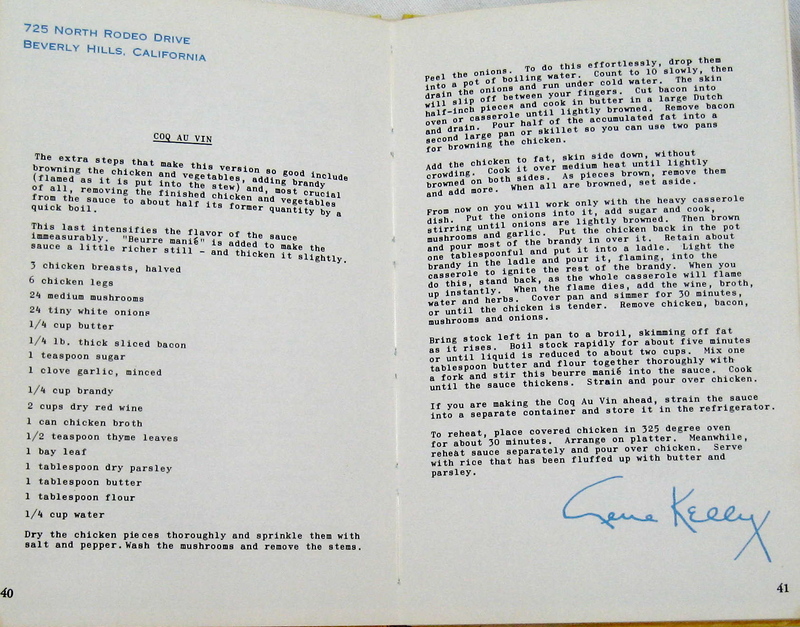 For Dinah Shore’s celebrity cookbook, Kelly offered up his recipe for coq au vin. Rosemary Bradley features Kelly’s “‘I’ll Be Right Back’ Shrimp” in her Treasury of Favorite Recipes. Finally, here is Kelly tap-dancing a recipe for linguini (yes, you read that right) on The Danny Kaye Show (1963-67). To accompany Gene Kelly’s coq au vin, here are 10 more recipes from stars of Hollywood’s classic era, as found in Frank DeCaro’s book The Dead Celebrity Cookbook: A Resurrection of Recipes from More Than 145 Stars of Stage and Screen. Add cheese and butter to bowl of a food processor and blend until smooth. Add flour, Tabasco and Worcestershire sauce to form dough. Wrap each olive in a small amount of dough, completely covering the olive and forming a ball. Place on an ungreased cookie sheet and freeze. Transfer to a plastic bag and store in freezer until ready to use. To cook, place on a baking sheet and bake at 400˚ F for 12 minutes, or until crust is golden. Serve hot. Before chopping, wash all vegetables thoroughly. Pour spring water into a soup pot and add the rest of ingredients. Cover and simmer until celery is tender. Allow the broth to cool to room temperature. Refrigerate in glass jars. Serve hot or cold. 1 1/2 cups cooked beets. Chop all ingredients and combine in a large bowl. Season to taste and moisten mixture with cream. Place in a hot buttered skillet. Stir and spread evenly in pan. Brown slowly over medium heat. Serve with poached eggs on top. Sprinkle avocado with lemon juice. Cover and refrigerate. Season chicken with salt and pepper. In a large heavy skillet, over low heat, heat 3 to 4 tablespoons butter and sauté chicken until juices run yellow when it is pricked with a fork, about 35 to 40 minutes. Use two skillets if necessary, adding more butter as needed. Transfer cooked chicken to a serving dish. Cover loosely with aluminum foil. Keep warm in a 300 degree F oven for 15 minutes, while preparing sauce. To make the sauce, add shallots to skillet. Cook over medium heat, stirring and scraping sides and bottom of pan with wooden spoon. Add cognac and wine and bring to a boil. Boil until mixture has almost evaporated. Add cream and boil 5 minutes longer. Add chicken stock to cream mixture. Cook over medium heat, stirring constantly, until thick. While sauce cooks, sauté mushrooms over high heat in butter. Add the mushrooms, remaining cognac, and avocado cubes. Stir until well blended. Pour over chicken. Sprinkle with parsley. Rinse and dry fish. Cut lemons in thin slices. Place slices on both sides of the fish. Wrap fish in a double thickness of cheesecloth and secure with kitchen string. Put water, onions, celery, parsley, bay leaves, crushed peppercorns and salt in a fish poacher or on a rack in a deep saucepan. Cover and simmer 30 minutes. Preheat a heavy frying pan and sprinkle bottom lightly with table salt. Mix meat, handling lightly, just enough to form into four patties. Grill over medium-high heat about 4 minutes on each side. Pour chilled bourbon in chilled shot glass and serve meat and bourbon on a TV tray. Soften gelatin in 1/4 cup milk. Stir beaten yolks, salt, and sugar in the top of double boiler over hot water. Add gelatin. Add scalded milk gradually, stirring until the mixture coats the back of a spoon. Cool. When completely cool, stir in coconut. Fold beaten egg whites and extract into custard. Pour into mold and refrigerate until firm. Unmold and serve garnished with coconut and orange sections. Using an electric mixer, beat the ricotta in a large bowl for 1 minute. Add confectioner’s sugar and beat until light and creamy, about 5 minutes. Add cinnamon, chopped citron, and chocolate chips and mix until well blended. Refrigerate until ready to use. To make cannoli shells, sift flour, sugar, and cinnamon together into a large bowl. Make a well and pour wine into it and mix until incorporated. On a floured cutting board, knead dough until smooth and stiff, about 15 minutes. If dough is too moist or sticky, add some flour. If it’s too dry, add more wine. Cover dough and let it rest two hours in a cool place. Melt chocolate and butter in a heavy saucepan over low heat. Remove from heat and stir in sugar. Add eggs and vanilla and beat well. Stir in flour, salt and walnuts. Mix well. Pour into a buttered 8-inch square baking pan. Bake at 325˚ F for 40 minutes. Cool and cut into squares. For other celebrity recipes or recipes inspired by celebrities, check out the following books and/or People’s “Cooking with the Stars” section, where you can find Lady Gaga’s favorite fried chicken and Gwyneth Paltrow’s meatballs and garlic bread. All recipes excerpted from The Dead Celebrity Cookbook: A Resurrection of Recipes from More Than 145 Stars of Stage and Screen by Frank DeCaro.